The 36 Verdi Transcriptions for piano by the British composer Michael Finnissy were composed between 1972 and 2005. They are based on the works of Giuseppe Verdi. Michael Finnissy is an English composer and pianist. In music, transcription can mean notating a piece or a sound which was previously unnotated, as, for example, an improvised jazz solo. When a musician is tasked with creating sheet music from a recording and they write down the notes that make up the piece in music notation, it is said that they created a musical transcription of that recording. Transcription may also mean rewriting a piece of music, either solo or ensemble, for another instrument or other instruments than which it was originally intended. The Beethoven Symphonies by Franz Liszt are a good example. Transcription in this sense is sometimes called arrangement, although strictly speaking transcriptions are faithful adaptations, whereas arrangements change significant aspects of the original piece. Giuseppe Verdi's String Quartet in E minor was written in the spring of 1873 during a production of Aida in Naples. It is the only surviving chamber music work in Verdi's catalogue. Ferruccio Busoni was an Italian composer, pianist, conductor, editor, writer, and teacher. His international career and reputation led him to work closely with many of the leading musicians, artists and literary figures of his time, and he was a sought-after keyboard instructor and a teacher of composition. Ian Pace is a British pianist. Pace studied at Chetham's School of Music, The Queen's College, Oxford and the Juilliard School in New York. His main teacher was the Hungarian pianist György Sándor. Mikhail Anatolyevich Svetlov is a Russian bass known for the range and beauty of his voice as well as his acting ability. His voice described by the Washington Post as a "titanic, all-encompassing bass". He was nominated for a 2003 Grammy Award for a recording of Stravinsky's Histoire du Soldat and is the first Russian bass ever to perform the title roles in Don Giovanni and The Flying Dutchman. Stefan Dimitrov was a basso opera singer. Born in the Black Sea town of Burgas, Bulgaria, he was of Greek origin. He won four international singing competitions at the very beginning of his career: those in Toulouse, the "Erkel" in Budapest, the "s’Hertogenbosch" in the Netherlands, and the "Young Opera Singers" in Sofia. In 1965 Stefan Dimitrov met the piano accompanist and répétiteur, Malina Dimitrova, who graduated at this time and took her first steps in the opera accompanying field. They were later to be married. The couple had one son, Liuben, who graduated as solo pianist and later become part of the Genova & Dimitrov piano duo. After Aida is a 1985 play-with-music by Julian Mitchell. It is about Giuseppe Verdi, and the pressure put upon him after his attempt to retire from composing. 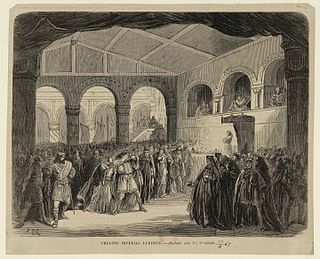 Continued insistent prodding from his friends eventually results in one of his greatest masterpieces, the opera Otello, which premiered in 1887. Anthony Michaels-Moore is an English operatic baritone and the first British winner of the Luciano Pavarotti International Voice Competition. Anthony has since performed in many of the world's major opera houses across Europe, the Americas, and Asia. He has distinguished himself as a specialist in Verdi and Puccini roles, most renowned for his portrayals of Falstaff, Nabucco, Rigoletto, Simon Boccanegra, Iago in Otello, Germont in La traviata, Sharpless in Madama Butterfly, and Scarpia in Tosca. In addition to the standard repertoire, he has sung and recorded the baritone roles of some of the less-known 19th Century Italian operas, as well as the popular English art song cycles by Stanford and Vaughan Williams. Eduard Philip (Ed) Spanjaard is a Dutch conductor and pianist. Željko Lučić is a Serbian operatic baritone who has had an active international career since 1993. He was a member of the Serbian National Theatre in Novi Sad from 1993–1998 and at the Frankfurt Opera from 1998-2008. He is particularly well known for his performances in the operas of Giuseppe Verdi; having portrayed a total of 23 leading roles from the great composer's works. Carlo Grante is an Italian classical pianist. He graduated at the National Academy of St Cecilia in Rome with Sergio Perticaroli. Later he also studied with Ivan Davis, Rudolf Firkušný, and Aliza Kezeradze. He is known as a performer of mainstream classical composers such as Franz Liszt, Wolfgang Amadeus Mozart, and Domenico Scarlatti, as well as highly demanding late romantic and 20th-century composers such as Leopold Godowsky, Ferruccio Busoni, George Flynn, Roman Vlad, Paolo Troncon, Michael Finnissy, Alistair Hinton and Kaikhosru Shapurji Sorabji. His discography consists of more than 50 albums. ↑ Finnissy (2016), p. (3). ↑ Pace (2001), p. 3. ↑ Pace (2001), p. 6. ↑ Finnissy (2002), pp. (3)–(4). ↑ Pace (2001), pp. 8–9. ↑ Finnissy (2016), pp. (1)–(3): Pace (2001), p. 9. ↑ Pace (2016), p. (10). Finnissy, Michael (2016). "Notes to the Music", in Verdi Transcriptions (programme 13 March 2016), Guildhall School of Music, pp. (1)–(3). Pace, Ian (2001). "Michael Finnissy and Transcription", in booklet accompanying CD set Michael Finnissy Verdi Transcriptions. Metier Records, CDs MSV CD92027 a/b. Pace, Ian (2016). "A Guide to the Verdi Transcriptions of Michael Finnissy", in Verdi Transcriptions (programme 13 March 2016), Guildhall School of Music, pp. (4)–(10).